The Mirror effect allows you to create a reflection of the image. 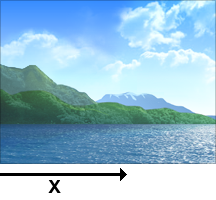 A reflection of the image at X = 63%. The line of reflection is at 63% of the image width. Use this option to change the position of the line of reflection as a percentage of the total width of the image. This option allows you to reflect the image vertically. This option allows you to keep the original image size.